“Dyslexia” is not synonymous with “non-reader” — and it is misleading to use the two as interchangeable. There maybe many reasons for an inability to read, and dyslexia is only one of them. Applying “dyslexia” too loosely is more than semantic misuse; it may actually preempt interventions that are more appropriate and less expensive. What are the intervention therapies for a non-reader? If students are beyond the third grade and have still not learned to read, we must assume that they have already encountered all of the standard reading instruction — whether it is phonics, whole word, language experience, or any other method — so, we can reasonably assume that more of the same will not be an answer. For non-readers beyond the third grade, there is an additional problem — they first need to be convinced that they can read. They have confronted the non-reader label over and over again, so they begin to identify as a non-reader, and they become less motivated to keep trying. The way to convince them that they can read is to present reading in its most primitive form — symbolic-semantic. One symbol stands for one word; this is the oldest, easiest, and most pervasive form of reading in the world. LOCAN is our version of this language form. To make reading even easier we have added a more concrete component to our language, so it becomes Figural-Symbolic-seMantic where each LOCAN glyph stands for one word. (SOI practitioners will see the value in engaging all three content modes simultaneously.) Using this type of language, students will become readers within two or three months of instruction. I can hear the reading specialists saying “That is gimmicky-reading; when are they going to really learn to read?” To them I would reply that they will have a hard time convincing the LOCAN readers that they cannot read — they know they are reading, and, more to the point, they begin to ask why they cannot read the conventional way. Once they see themselves as readers, it becomes much easier to engage them in making the transition to conventional (European-language) reading. In making the transition to conventional reading, we need to identify each of the components involved in the visual process of reading. Actually, that analysis has been done for us. It is the basis of IPP. 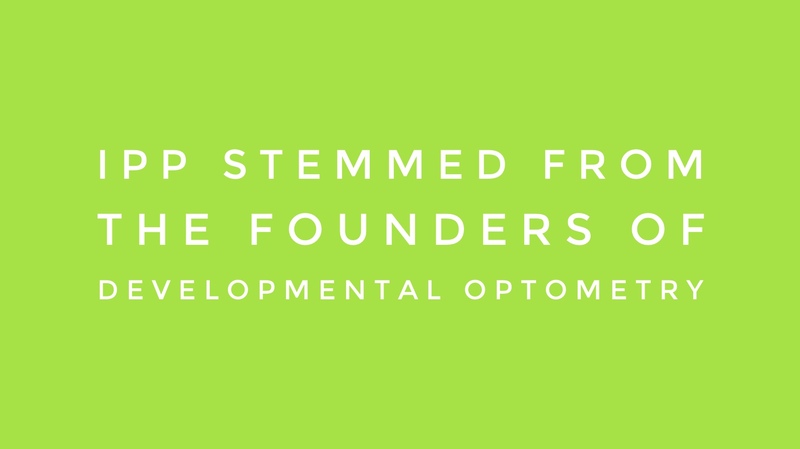 IPP stemmed from founders of developmental optometry — those who studied the visual processing of information. Once they identified the different components, it became apparent that these components had an integral relationship to reading. Each of the components became a focus of study — how to measure them and how to improve those which were weak. You can see at once that all of these skills are antecedent to semantic comprehension. If these skills are not in place, reading comprehension becomes exceeding difficult, if not impossible. Developmental optometry is designed to deal with these visual processing problems, and, thereby, remediate reading problems. IPP is a version of developmental optometry that is designed for paraprofessional practice. Practitioners of IPP do not need to become developmental optometrists; they need only follow the practices prescribed by the expertise of a management system. It directs them through an assessment, diagnosis, and training regime. In almost every case, this process will restore the vision mechanics of reading. In the rare cases where IPP training does not re-establish the mechanics of reading, they become the occasion to look at more profound and/or psychological conditions (including forms of dyslexia) that may be the root causes of reading failure. These are potential causes that require extensive testing and expertise to diagnose and treat — typically expensive and time consuming. This is the practical reason that IPP becomes the first-choice — low-cost, paraprofessional — procedure in diagnosing and treating prolonged reading failure. After the mechanics are in place, we need to build up the students’ reading repertoire. The primary component of this repertoire is vocabulary — not just unpacking the sounds of words, but also knowing the conceptual content — what the words mean. This type of repertoire is best built over time by reading successively more challenging articles and books. Some vocabulary study for its own sake is worthwhile, but discovering the meaning in context is more useful in the long run. So, the road back to reading is: convince the students that they can read; reestablish the visual mechanics of reading; and then build vocabulary by extensive reading. This is the way to ever-more comprehensive engagement with the world of written language.